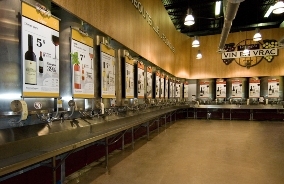 The first Vin en Vrac counter was established in 1992 on Futailles Street, in Montreal. 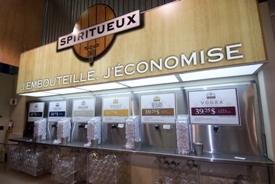 The original idea came from Mr Jocelyn Tremblay, President of the SAQ at the time. At first, Vin en Vrac only offered a rather narrow range of wines, all of them table wines. In 1999, Vin en Vrac opened a second store in Saint-Hyacinthe right next to the Highway 20. Since then, both stores have diversified their selection of wines and now offer high quality products. Today, you can find a wide variety of wines originating from various countries such as France, Italy, Australia, Spain, United States, Chile, Argentina and South Africa. Moreover, we have diversified our products by adding a range of spirits at competitive prices available in 1,75 L (60 oz) format.